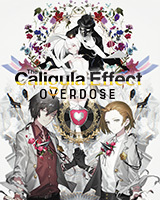 The Caligula Effect: Overdose | NIS America, Inc.
• An Overdose of New Features - The Caligula Effect: Overdose boasts enhanced visuals and gameplay! Explore new scenarios, endings, and the “Forbidden Musician Route” while escaping the virtual world of Mobius. • The New Faces of Kishimai High - Play as the newly added female protagonist! Plus, meet two new members of the Go-Home Club, who each have their own new Ostinato Musician to face. • Use the Imaginary Chain! - Turn-based battle meets exhilarating action in this refined JRPG battle system! Develop a flawless strategy after using the Imaginary Chain to predict what your enemies will do next! • Unite and Escape - Sometimes, it’s hard to go it alone. Befriend over 500 other students in this imaginary paradise to improve your skills in battle and ultimately return to reality.